Ready for some serious breakfast inspiration? The Irvington (located at the W Hotel Union Square) is your new go-to. Yes, that's powdered sugar on top. If you say your mouth isn't watering right now you're just lying. The contemporary decor & friendly staff didn't make me think "hotel restaurant" once. Other less splurge-worthy options on the menu included fresh seasonal berries, a salmon & bagel plate, & eggs florentine with sautéed kale and roasted potatoes. Yum! Did I mention there's weekend brunch? #RunDontWalk to Irvington! 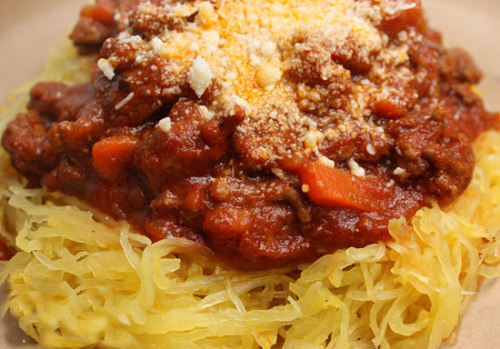 The spaghetti squash hype is no secret these days. Jump on the bandwagon and find out why you should be eating it! First off, what the devil is a spaghetti squash? It’s a yellowish type of squash that contains seeds and a stringy center that, when heated, can be scraped out to resemble noodles. Although the stringy center resembles spaghetti noodles, the consistency is a bit more grainy and firm. The end result is a gluten free pasta and casserole alternative, perfect for those of you jumping on the gluten-free bandwagon. As I Googled preparation tips for this type of squash, I was surprised. People know how to cook this stuff six ways to Sunday. I chose a simple method considering it was my first time. It mimics a traditional spaghetti and meat sauce recipe. Enjoy! using a fork, horizontally scrape out the noodles on both halves of the squash. The skin is very hot after baking in the oven, so bring back that kitchen rag you used to cut the squash so you don’t burn yourself! I sautéed one package of lean ground beef and seasoned it with Publix Total Seasoning Blend, salt, pepper, and garlic salt to taste. Any kind of sauce works with this recipe, but I used traditional vodka sauce for a creamier taste. I also aded salt, pepper, and butter to the noodles. Add a bit of shredded parmesan cheese and you’re good to go!